Doña Flor, selling her tacos, calls out, “Tacos, tacos. Cómodos pal’ bolsillo y buenos pal’ corazón.” But she then also translates for the taco-buying monolingual Pochos strolling down the streets, at low riders’ speed, “Heels, heels. Easy on your feet, and good for your corazón.” Reason why Pochos and Pochas in EastLos say, “Que rico!” often. Down the street and on the other corner Doña Ramona slaps the pupusas with her tender hands into shape, like beating the skins of ancient drums that will bring even your palate to dance, after you have tasted one. And they only go for a dollar and twenty-five cents, ese! That’s why in EastLos we say we have “barrio prices.” Jejeje. And we are all for legalizing not just those without papers, stamps and letterhead, but the home flavors of the street vendors, too. 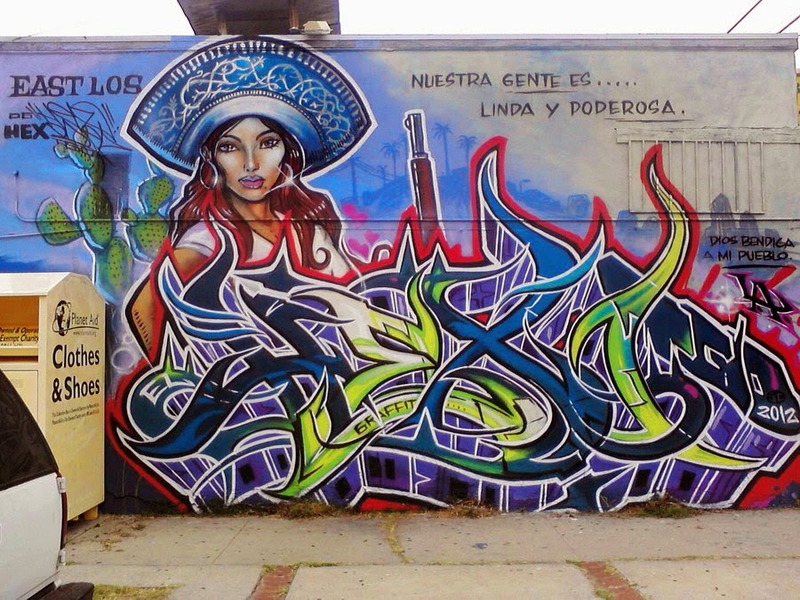 Because we have so many languages to choose from in EastLos, like Zapotec, Mixtec and Maya K’iche’; English, Pocho, Spanish and Spanglish, we say all sorts, or a surtido of things like: Órale carnality@, Viva La Raza, Sí Se Puede, Ese, Vato, Pachuco, Comunidad, Chido, Chingón, Chévere, Cheech Marin, and Zapatismo, but, oops, that’s more than ten. Every Friday after school, to start the weekend right, we turn to the left of the radio dial and listen to The Pocho Hour of Power, because it’s like going to laughing church. And we laugh. Yes, we laugh a lot. We treat the whole barrio like our backyards in EastLos, or the front lawns most of us don’t have. But like Doña Flor sometimes says, “…and you can put a smiley face on that, mi’jo.” : ) And in EastLos, of course, we say “Salud” and “Gracias!” very much, también.